March 野ウサギ, うさぎ and Mad Hatter:best friends!. 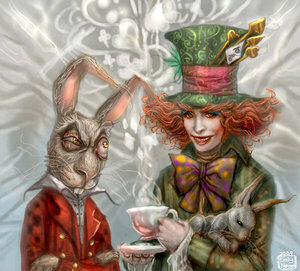 The Mad Hatter with his best pall, the March Hare.. Wallpaper and background images in the アリス・イン・ワンダーランド（映画） club tagged: hare hatter march mad best palls wonderland. The detail is great! wow!